An erect summer annual that may reach 6 1/2 feet in height. 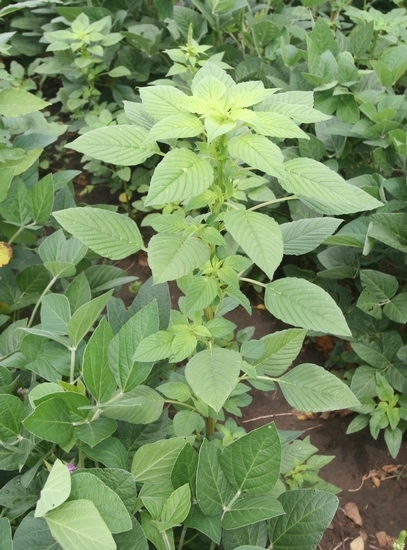 Palmer amaranth closely resembles many other pigweed species, and is found throughout the southern United States from southern California to Virginia. 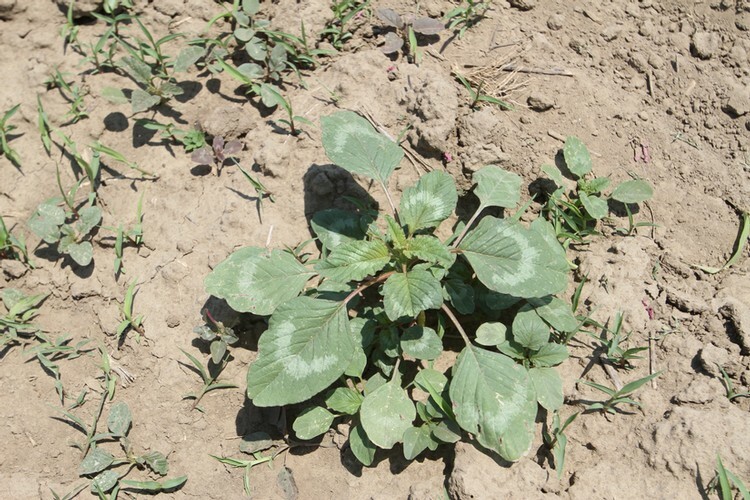 Stems below the cotyledons (hypocotyls) are without hairs (glabrous) but may sometimes be slightly hairy, and are often red in color. 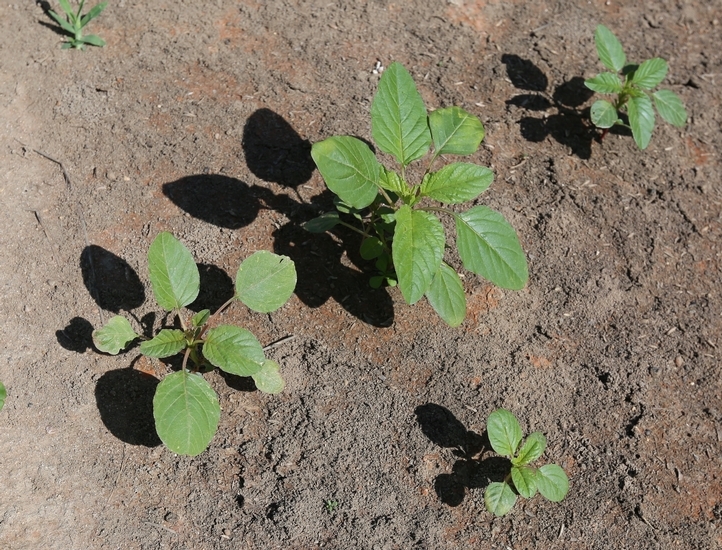 Cotyledons are narrow (10-12 mm long) and green to reddish in color on the upper surface. 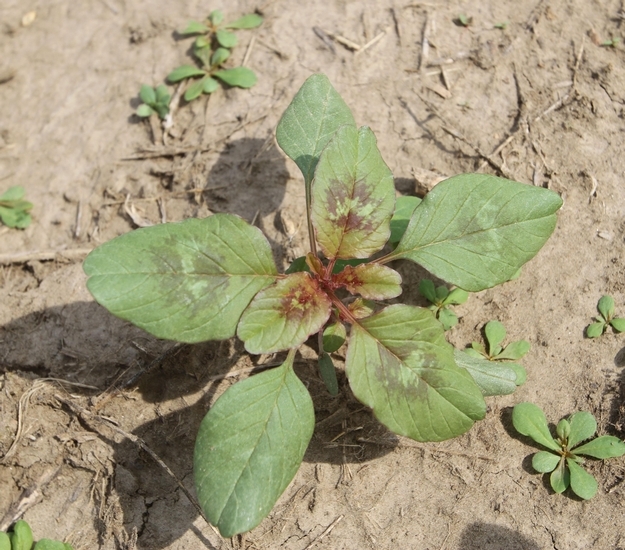 Lower surfaces of cotyledons have a reddish tint. First true leaves are alternate, ovate in shape, and are slightly notched at the tip of the leaf blade (apex). Alternate, without hairs (glabrous), and lance-shaped or egg-shaped in outline. 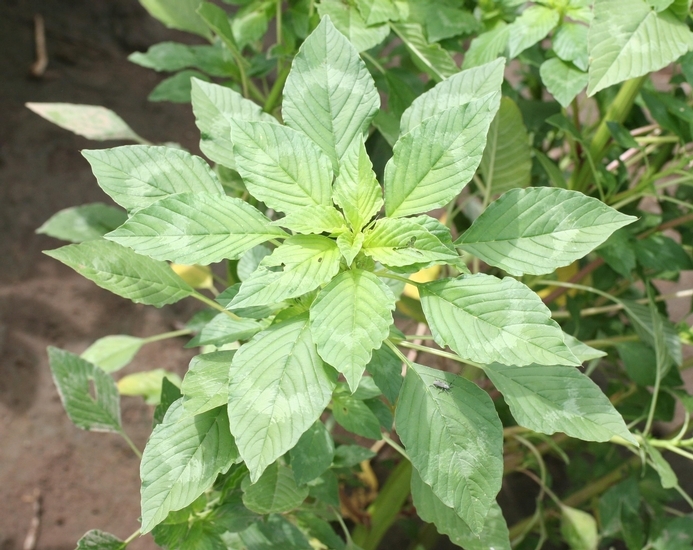 Leaves are 2 to 8 inches long and 1/2 to 2 1/2 inches wide with prominent white veins on the undersurface. 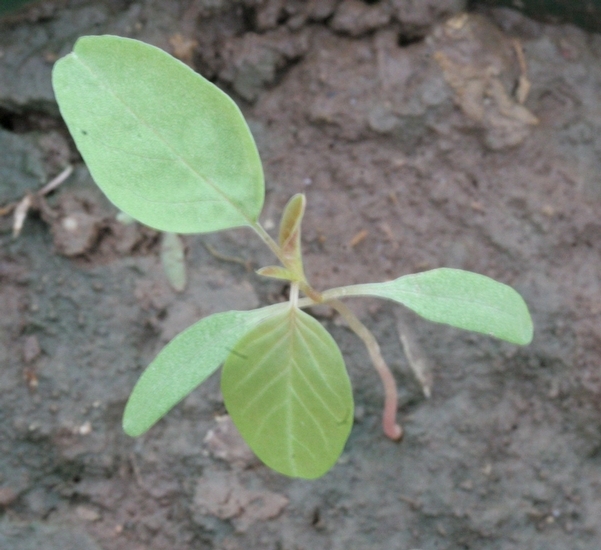 Leaves occur on relatively long petioles. One central stem occurs from which several lateral branches arise. 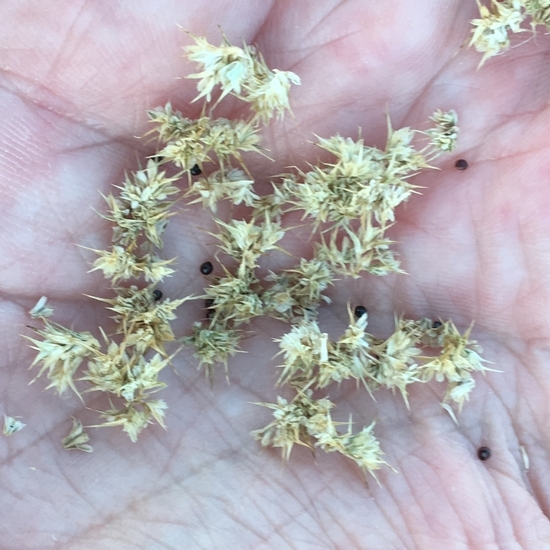 Small, green, inconspicuous flowers are produced in dense, compact, terminal panicles that are from 1/2 to 1 1/2 feet in length. Smaller lateral inflorescences also occur between the stem and the leaf petioles (leaf axils). Male and female flowers occur on separate plants. 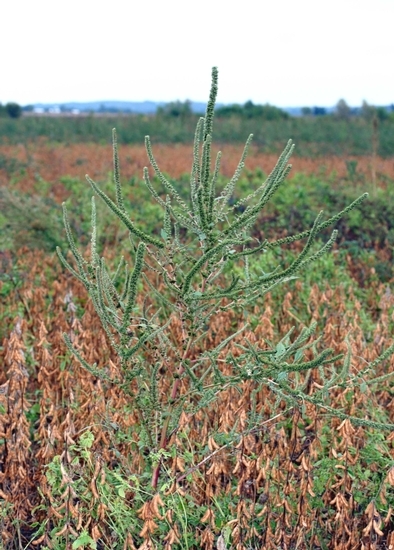 Each terminal panicle contains many densely packed branched spikes that have bracts that are 3 to 6 mm long. A single seeded utricle that reaches 2 mm in length and are wrinkled when dry. Each utricle splits open in the middle to expose a single glossy black to dark brown seed that is 1 to 1.2 mm long. Taproot that is often, but not always, reddish in color. 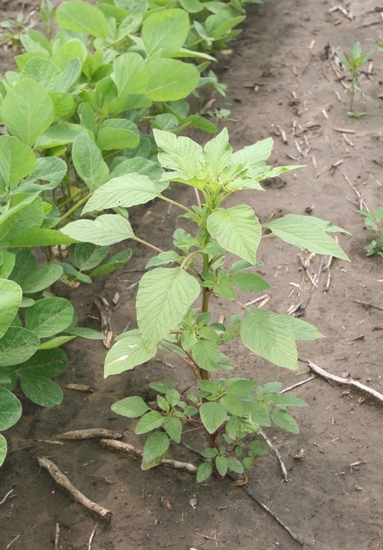 Dense, compact terminal panicles and relatively tall plants with alternately arranged leaves with petioles that are longer than the leaves. 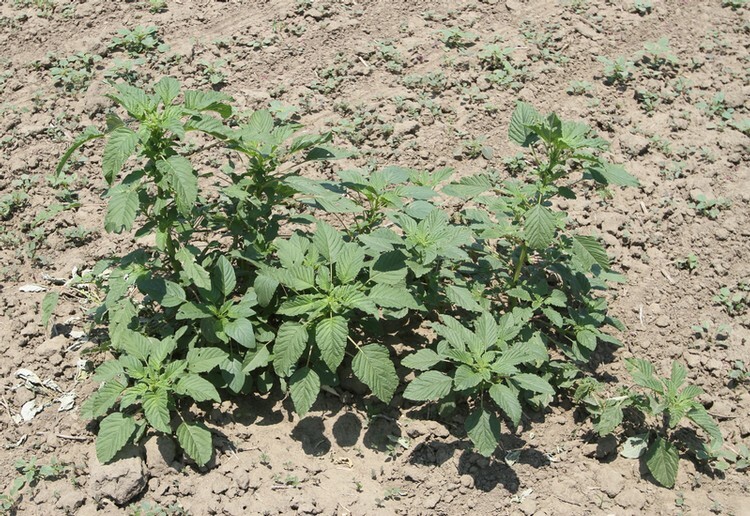 Palmer amaranth is often confused with other similar pigweed species. 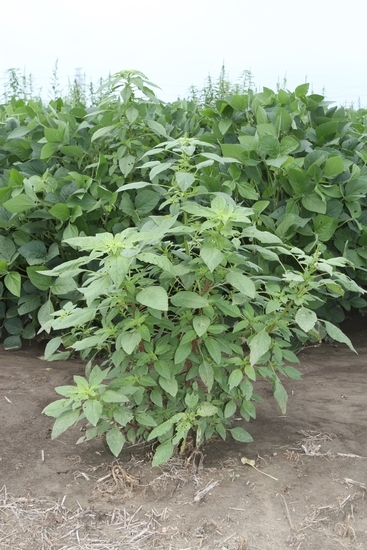 However, no other pigweed species have terminal panicles that reach 1 1/2 feet in length. 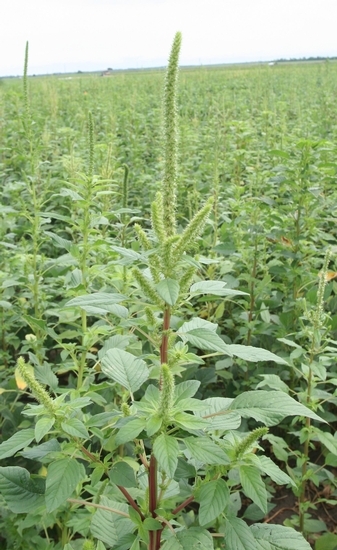 Additionally, the terminal spike of palmer amaranth is much smoother and narrower and less spike-like than either Redroot Pigweed (Amaranthus retroflexus) or Smooth Pigweed (Amaranthus hybridus). 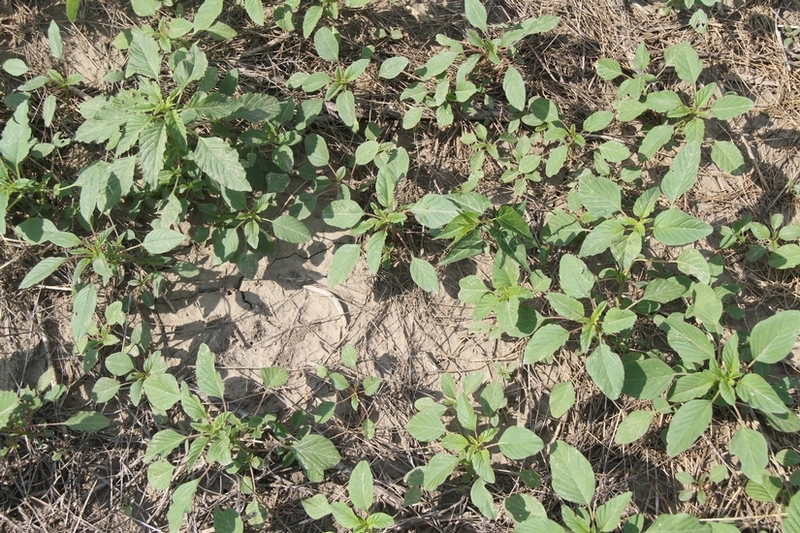 The leaves of palmer amaranth are also without hairs and have prominent white veins on the undersurface unlike those of redroot pigweed. 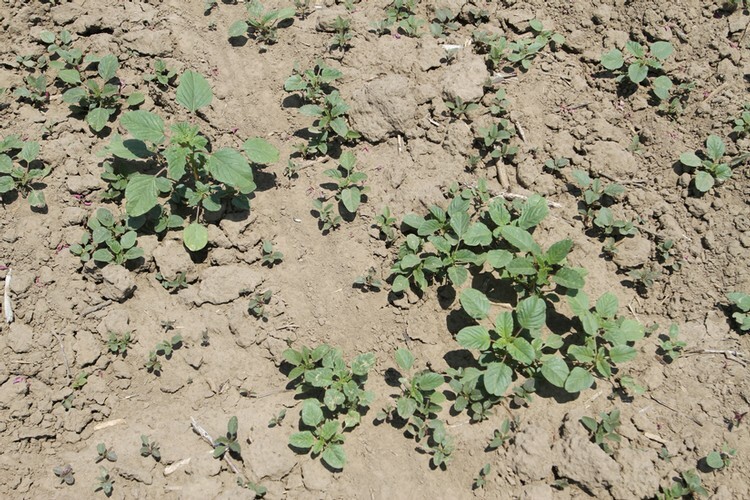 These species may also resemble Common Lambsquarters (Chenopodium album) in the cotyledon stage, however common lambsquarters cotyledons often have a mealy gray cast and the first true leaves are alternate, unlike any of the pigweed species.